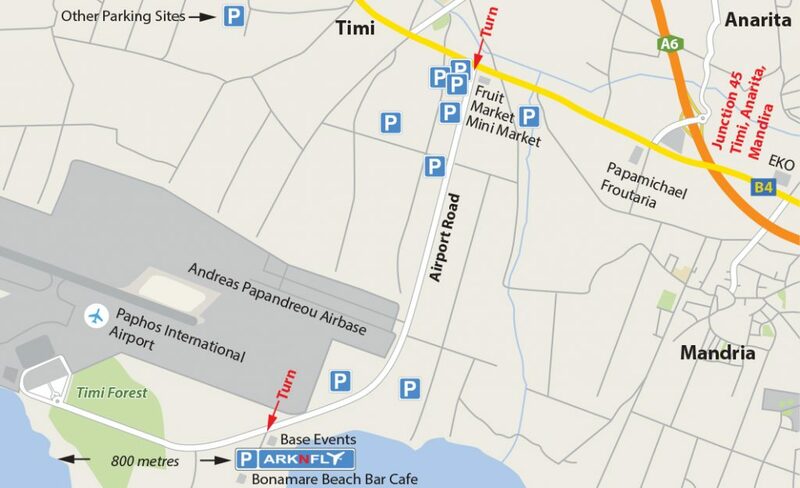 Location Map – Paphos Airport Parking | Park 'N Fly, €3 per day. 26 422 074. Paphos airpot parking location: after exiting the motorway you join with the B4, the old coastal road. This is not the airport road and you are still quite far from the airport itself. There are many other airport parking companies along this road but only Park ‘N Fly is opposite the airport. Continue to follow signs for the airport and you will eventually turn onto the Airport Road that leads to Timi Beach and Timi Forest in addition to the airport itself. The turn is easy to identify as it has two fruit markets, one on each side of the road. Once on the beach road you will find that we are the only parking on the left or sea side of the road. Before reaching us you will first pass an army airbase on the right hand side and then follow the road as it bends to the right until about half a kilometer before the forest. There is a large sign on the main road in the same style as the banner in the map above to indicate the turn for our compound. Other landmarks to look out for at our turn on the left are a large building called Base, a bus stop, the last electrical telegraph pole and a sign for the Bonamare Beach Bar Café. All signs can be seen coming from either direction. The Park ‘N Fly offices are located 100 metres up from the turn on the right hand side. It is a secure compound surrounded by a high fence. After checking in your car we will transfer you and your luggage in one of our free courtesy buses directly to the entrance of Paphos Airport. This is exactly the same place where we will pick you up from on your return. As the distance to travel is less than 1 km, transfer time in either direction is less than 2 minutes. The Airport requires you to check in 2 hours before your flight. If you are coming from far away and arrive early there is a beach bar at the end of our compounds road on Timi Beach called the Bonamare Beach Bar Cafe. Why not enjoy a cool drink or some hot food at reasonable prices before flying, or take a quick dip in the sea at this beautiful location.